Let the sunlight in to any room for a warm and bright atmosphere. With our selection of window coverings, you will add a touch of elegance to any part of your home. At our full-service store, we feature a wide selection of window treatments that make any room pop. Whether you are looking for blinds, shades, or shutters, you will find a complete variety of options for your space. Our window fashions are designed to enhance the atmosphere in any area. Shop at our showroom today to explore our eye-catching features for your home. When you are looking for a way to update your home to the modern age, choosing new details can make a major impact at an affordable price. Many homeowners do not realize the effect that a simple change can have on their space. From living rooms and kitchens to bathrooms and bedrooms, any room with a window will stand out when you add one of our stunning coverings. From blinds to shutters, our selection of window treatments includes options to fit every need. Our sales team is happy to work with you to help you select the right product for any space. We proudly offer products from top brands, including Hunter Douglas. When you shop with us for your new window coverings, you will find the perfect product that fits your wants, needs, and budget. Now is the time for you to take advantage of the 12-18 months special financing on our products. Call us today to find out more about this special offer. From Flooring America in Enid to you. We carry the Hunter-Douglas line of window treatments. We will measure for free! We also install what we sell! From blinds to shutters, our Hunter-Douglas selection of window treatments includes options to fit your every window covering need. Call us today or come in to look at samples of this great product! Click here to see the full Hunter-Douglas catalog of products. Bask in the auspicious or blackout options of premium Hunter-Douglas shades. Sometimes, it takes a small change to achieve a major impact. When you are tired of the same old look in your home, you do not have to go through a lengthy and expensive remodeling project. By adding colorful new window fashions, you will finish the style in any room. 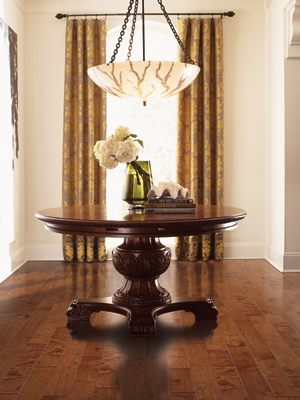 Our collection of products gives homeowners an easy way to add a focal point to every space. From living rooms to bedrooms, our coverings for windows make any area feel cozier than ever before. While window treatments are used by many homeowners as a way to add style to their rooms, these products serve a number of additional benefits in any space. If you have noticed you’re your electric bills are higher than they have been in the past, it could be due to old or outdated window coverings. Our treatments control the amount of sunlight that enters the room, giving you an effective way to lower your energy bills during the grueling summer months. You should feel safe in your home at all times. When you use these shades and shutters, you will keep prying eyes out of your bedroom, bathroom, or living room. Our coverings can be opened and closed to fit your needs, and each of our products deserves a top level of privacy in every home. Contact us to shop our selection of window coverings for any room in your home. We feature our window treatments for purchase throughout Covington, Billings, Lamont, Pond Creek, and Enid, Oklahoma.